In 2004, I traveled to Denmark, England and Ireland with my sister, mother and grandmother to visit various relatives on both sides of the family. I envisioned it as a way of reconnecting with our European family and discovering our Danish roots — 3-1/2 weeks of hanging out, catching up and having lots of fun. It wasn’t. Instead, what I hadn’t realized was this: Now that I am an adult, this no longer qualified as a family vacation, because a family vacation is not really a vacation unless you are under the age of 18. Consider using the following tips and reminders for your next family vacation — they just might save your sanity and salvage your family relationships. A family vacation such as mine is not a vacation, so rid yourself of that common misconception as soon as possible. You are with family. It is impossible to relax with family. Why? Because you are an adult now, and you are no longer immune from family issues, dysfunctional patterns and travel tension. You are now aware of what your family is really like. And you are stuck with your family for the duration of the trip, because it is your duty. Isn’t it fun? You will gain weight, no matter what. When you are visiting relatives, they will want to do nothing but feed you constantly. Each meal will include lots of good butter, amazing cheese and the best bread you’ve ever had (because you are in Europe). In between, there will be numerous offers of coffee and alcohol. 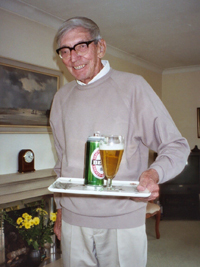 (That’s Great Uncle Jack serving up a cold one, by the way.) You will fall asleep in a stupor caused by too much eating and drinking. This will happen day after day. No, you can’t exercise to burn some of those excess calories — you will be too busy because you are visiting as many tourist sites as you possibly can because you are trying to pretend you are on vacation. Appreciate, respect and listen to your elders. Now that you are an adult, you are probably much less self-centered than you used to be. This is a wonderful quality, because you are finally able to see and appreciate your relatives in a way you couldn’t before. Your family members who are 60, 70, 80 or 90 years old have accumulated a wealth of wisdom and experience from living those years. They can tell countless fascinating stories. They have lived history, and they love sharing with you. They adore seeing you, relish your zest for life and enjoy witnessing your youthful energy (even though you think you are getting old). They are living treasures, so appreciate them. Time is short, and so is life. You won’t be on vacation forever, and your relatives won’t live forever. You might not see some of them again. Enjoy your time with them. Even if you grew up not really knowing your relatives, try to develop relationships with them as an adult. You can see them as more than just gift-giving machines now that you are older, and you can gain so much more. No, my trip to Europe did not meet my expectations. It was no vacation. But it ended up being an amazingly rich, wonderful experience that I couldn’t have realized except in retrospect. But not for a couple of years and after at least two or three REAL vacations — no family members allowed. Previously published by The Seattle Times.